“My father can’t read or write in English and my mother is illiterate, but they had a passion and the determination to support their children,” Professor Vinu explained. Now a globally acclaimed material scientist and Australia’s leading nanotechnologist, Professor Vinu is driven by a personal philosophy to give back and help others. Beginning with an undergraduate degree in Chemistry, he developed a determination to succeed from a young age. After completing a Masters in Chemistry with first class from Manonmanium Sundarnar University, Tamil Nadu, India, Professor Vinu’s career continued to flourish, which he puts down to his determination. Impressing his supervisors, Professor Vinu left India after obtaining a prestigious doctorate fellowship on immobilising biomolecules in a nanoporous system in Germany, going on to further respected positions in Japan and Australia, including International Young Scientist Fellow and Future Fellowship. Teaching himself many scientific principles, Professor Vinu has honed his passion and experience working with nanomaterials, devoting his career to exploring their development, capabilities and applications in energy generation and storage, drug delivery, carbon capture and conversion, and catalysis. Just a couple of the projects under his leadership include utilising nanomaterials to convert carbon dioxide into clean fuel with only sunlight and water, value adding products through catalytic pathway, utilising nanoporous architectures for developing next generation energy storage and conversion devices, and the selective removal of cancer causing molecules. Now the Director of the University of Newcastle’s Global Innovative Centre for Advanced Nanomaterials, Professor Vinu is leading the charge in translating basic materials research into real-world products. The centre has established a global research environment with a high standard of novel ideas for developing excellent advanced technologies for the betterment of society, specifically looking at energy, environment and health solutions. “How do we do that in nanomaterial? We design a series of advanced nanostructures with different and unique properties suited to a purpose. Thinking back to his roots, Professor Vinu is focused on working to nurture the next generation of brilliant minds with a motto in mind – save the world and help the people. “Helping the people through my work in science is my passion. I’ve achieved a great deal and now I want to give back to society. “One of the highlights of leading this centre is the vibrant research groups comprised of leading researchers from all over the world who are working together to develop innovative materials and technologies through advanced infrastructure and innovation in materials science research and education. “This global materials science platform offers creative approaches with innovation solutions for tackling global problems, which makes us unique from other centers established in Australia and other countries. 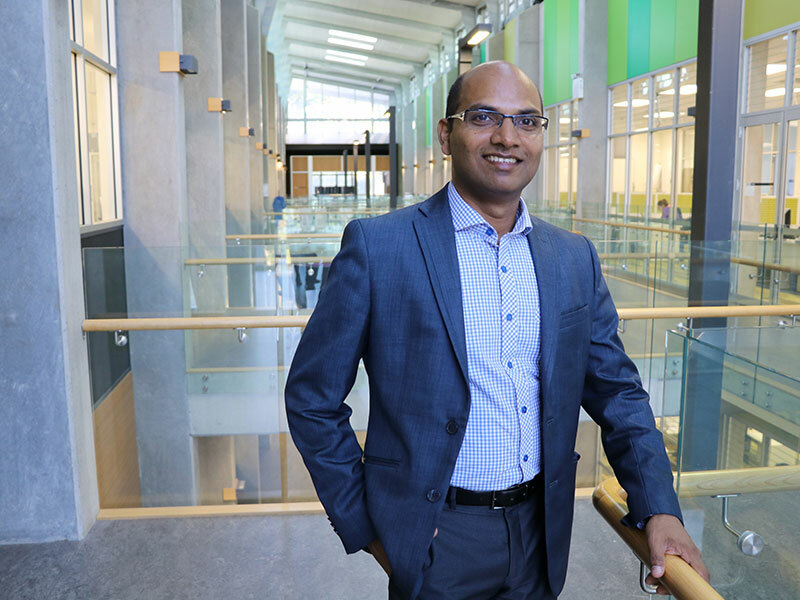 “I hope by nurturing the young people I now work with, I will play a part in fostering the next generation of leaders in the scientific world, and our work in advanced nanomaterials will revolutionise people and the world,” Professor Vinu said. Researcher highlight, Professor Ajayan Vinu, Global Innovation Chair for Advanced Nanomaterials. Prof. Vinu is currently working as a Global Innovation Chair Professor for Advanced Nanomaterials and the Inaugural Director of Global Innovative Center for Advanced Nanomaterials at the University of Newcastle, Australia from October 2017. Before joining at UON, Prof. Vinu was working as a Full Professor of Nanomaterials, at the Future Industries Institute, University of South Australia, Mawson Lakes, Australia (2015 to 2017). His previous employment was as a Full Professor and ARC Future Fellow at the University of Queensland, Brisbane, Australia during September 2011-2015. 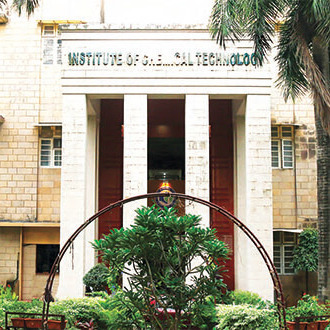 Before moving to Australia, he had been working as a senior researcher at the National Institute for Materials Science (NIMS), Tsukuba, Japan since 2006 after he had successfully completed two years of the ICYS fellowship at the same institute and a few years of research at the Technical University of Kaiserslautern (TUK), Germany. Although Prof. Vinu registered his PhD at Anna University, he performed most of his PhD work at the TUK, Germany (2000-2003). During these 15 years of research, Prof. Vinu has made a tremendous contribution in the field of nanoporous materials and their application in sensing, energy storage, fuel cells, adsorption and separation, and catalysis. The quality of his research has been recognised with several international awards including Chemical Research Society of India Medal 2018, Scopus Young Researcher Award 2014, Friedrich Wilhelm Bessel award by the Humboldt Society (2010), JSPS Senior Invitational Fellow for the year 2014, Australian Future Fellowship (Professorial Level) for the year 2010, Indian Society for Chemists and Biologists award for excellence for the year 2010, Catalysis Society of India Young Scientist award for the year 2010, Chemical Society of Japan Award for the Young Scientist for the year 2008, Laureate of Khwarizmi International Award 2008, Asian Excellent Lectureship Award, and ICYS fellowship. Prof. Vinu is honoured with the Fellow of Royal Society of Chemistry, FRSC (UK), Fellow of Royal Australian Chemical Institute (FRACI), Fellow of World Academy of Ceramics (FWAC), Fellow of World Academy of Arts and Science, and Foreign Fellow of Maharashtra Academy of Sciences, FFMAS. His contribution in the field of nanoporous materials is also clearly reflected by his international ranking by Science Watch as one of the top 15 researchers in the field and has led to ca. 340 papers in high impact factor journals with ca. 16,100 citations and a H-index of 65. His research has been published in top journals like Angew. Chemie, Nano Letters, J. Am. Chem. Soc., Adv. Mater, Adv. Funct., Mater. Chem., Eur. J., Chem. Mater., etc. with an average of 850 citations per year. At least 42 of his papers have been cited more than 100 times (18 papers have been cited more than 200 times) and 80 papers have been cited more than 50 times. The innovative nature and commercial potential of his research is evidenced by 32 national and international patents. 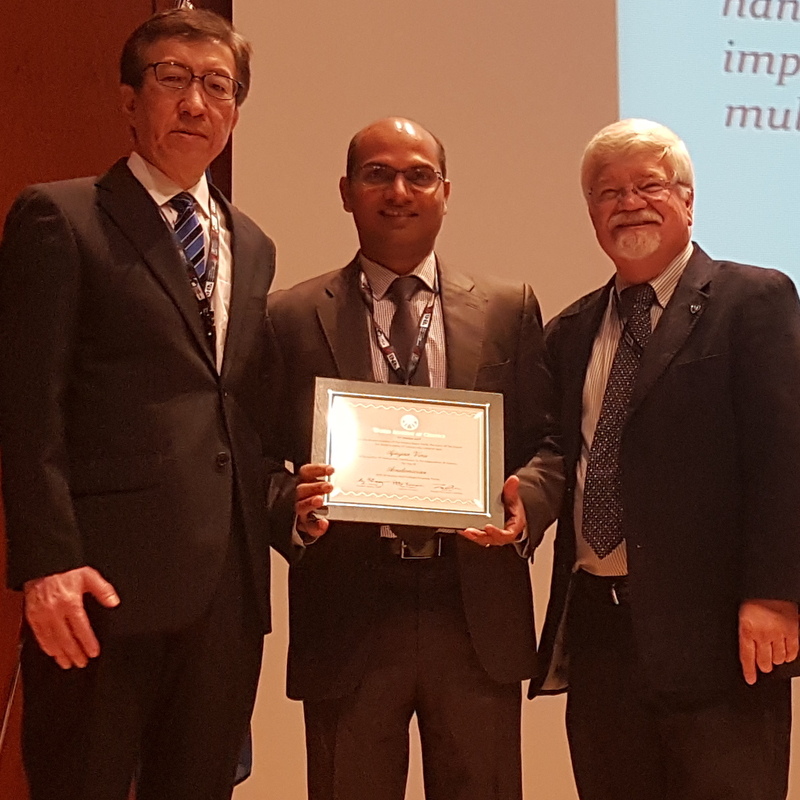 He has been awarded for novel mesoporous carbon, silica and carbon nitride materials. He has received more than $9.0 million AUD from both industry and government funding agencies. He has also been invited to write several chapters by renowned publishers including Wiley, Elsevier and American Scientific. This numerical data reveals the high quality of his research, innovative ideas and creativity. He is the Editor of Science of Advanced Materials and Australian Editor of Journal of Nanoscience and Nanotechnology and recently, was invited and appointed as the Editor-in-Chief of Advanced Porous Materials by the American Scientific Publishers for a period of five years. He has been recently appointed as the Editorial Board Member of Scientific Reports, a Nature Publishing Group and Chemical Record, a Wiley Journal for three years. Professor Vinu is also in the Editorial board of several journals namely Journal of Nano Science and Nanotechnology, Current Science, etc. His research has attracted worldwide attention and he has been invited to deliver presentations at numerous international conferences, workshops and seminars and chaired sessions of several international conferences. Professor Vinu has visited institutes in more than 40 countries to deliver lectures and gave ca. 220 lectures including 32 plenary and 28 keynote lectures at international conferences as well as ca. 160 invited talks. Because of his outstanding performance and collaboration activities, he was offered honorary professor position from leading universities including Hokkaido University, Japan, Yonsei University, South Korea, Kyungpook National University, South Korea, Fudan University, China, Jilin University, China, Mangalore University, India, and Anna University, India, and Adjunct Principal Researcher from Korean Research Institute for Chemical technology, Daejeon, South Korea. Professor Vinu has a network of collaborations with researchers in 15 countries. © 2017 Elsevier Ltd. All rights reserved. This chapter describes the self-assembly process for the mesoporous carbons (MC) prepared using soft and hard templates. Design and modification of MC mainly depends on the templates which are prepared via the self-assembly of inorganic and organic molecules. These self-assembly processes play an important role in controlling the structure, morphology, and textural parameters of the suitable templates to be used in the preparation of MC with controlled structure, pore diameter, and morphology. In this article, self-assembly process of specific molecules towards the development of MC has been emphasized with selected examples. This chapter discusses recent trends and advances of mesoporous molecular sieve in catalysis and also highlights the potential of these catalysts particularly in the field of organic reactions, which properly modified mesoporous catalysts are capable to catalyze. Successful synthesis of mesoporous molecular sieves has opened a new fascinating research area in inorganic chemistry strongly connected with organometallic chemistry and solid state chemistry and has potential applications in adsorption, drug delivery and catalysis. Mesoporous molecular sieves doubtless accelerated the development of new interesting catalysts in acid, base, and redox catalysis. In addition, large surface areas together with pore sizes in mesopore range enable the immobilization of highly active and selective homogeneous catalysts. Examples of mesoporous molecular sieves-involving acid-catalyzed reactions, hydrodesulfurization, metathesis, hydroxyalkylations, and C-C bond forming reactions (Heck reaction or Suzuki reaction) have been provided in the chapter. Activity of synthesized catalysts strongly depends on the type of mesoporous support under investigation, way of its modification, interaction of active species with the surface, and reaction conditions. Catalytic systems based on mesoporous silica or alumina supports modified with transition metal oxides for hydrodesulfurization (MoO3) and metathesis of olefins and unsaturated esters have also been discussed in this chapter. © 2009 Elsevier B.V. All rights reserved. © 2019 The quest for producing cost-effective and efficient adsorbents for CO 2 capture has received enormous attention in recent times. Biomass-derived porous carbons are considered to be the most preferred adsorbent materials for CO 2 capture owing to their excellent textural properties, tunable porosity and low cost. Different type of activation processes including solid-state activation possess generate appropriate morphology and other physico-chemical properties in these materials which enable them to act as effective adsorbents for CO 2 capture. In this review, the key scientific results from published literature have been consolidated and critical commentary has been provided to give a broad insight into the production of biochar and activated porous carbons and their application in CO 2 capture. A thorough review of the mechanism of pyrolysis for cellulose, hemicellulose and lignin has been presented in detail. The ability of different activating agents to produce activated porous carbons has been discussed. A summary of the application of biochar and activated porous carbons for CO 2 capture has been included. The review concludes with an overview of future outlook and potential research direction that could be undertaken for advancing the utilization of biomass-derived porous carbon materials for applications including CO 2 capture and energy storage. © 2018 Elsevier Ltd Porous carbons have been considered very important for a long time because of various possible applications. In this review, we summarize the current progress in the field of porous carbons, especially N-enriched carbons, obtained from the carbonization of MOFs with or without additional N-containing compounds. Moreover, metal- or metal oxide-loaded N-doped carbons are also dealt with. Not only the preparation but also the applications in adsorption and catalysis are summarized. More importantly, research ideas or trends will be suggested for further development of these fields. Finally, this study summarizes a number of methods for the preparation of N-enriched carbons (with or without metal or metal oxide) and their efficiencies in various potential applications, including adsorption (liquid-/gas-phase) and organo-/photo-/electro-catalyses, based on their physicochemical properties. © 2018 Wiley-VCH Verlag GmbH & Co. KGaA, Weinheim Highly ordered mesoporous C 60 with a well-ordered porous structure and a high crystallinity is prepared through the nanohard templating method using a saturated solution of C 60 in 1-chloronaphthalene (51 mg mL -1 ) as a C 60 precursor and SBA-15 as a hard template. The high solubility of C 60 in 1-chloronaphthalene helps not only to encapsulate a huge amount of the C 60 into the mesopores of the template but also supports the oligomerization of C 60 and the formation of crystalline walls made of C 60 . The obtained mesoporous C 60 exhibits a rod-shaped morphology, a high specific surface area (680 m 2 g -1 ), tuneable pores, and a highly crystalline wall structure. This exciting ordered mesoporous C 60 offers high supercapacitive performance and a high selectivity to H 2 O 2 production and methanol tolerance for ORR. This simple strategy could be adopted to make a series of mesoporous fullerenes with different structures and carbon atoms as a new class of energy materials. © Springer Science+Business Media New York 2015. Pd nanoparticles were supported on the surface of g-C3N4 by a facile method assisted by ultrasonication. The Pd/g-C3N4 catalyst was characterized by N2-adsorption, X-ray diffraction (XRD), transmission electron microscopy (TEM), and X-ray photoelectron spectroscopy (XPS). The XRD and TEM analyses reveal that the Pd nanoparticles are evenly distributed on the surface of g-C3N4 with an average size of 4 nm. The XPS results indicate that the Pd interacts with the N of g-C3N4. The supported catalyst shows high efficiencies in Suzuki- Miyaura reactions with up to 99% isolated yield under mild reaction conditions. The catalyst can be easily recycled at least 3 times without any loss of activity and selectivity. The excellent performance of the catalyst in activity and reusability may be attributed to the strong interaction between g-C3N4 and Pd nanoparticles, and the robust nature of the CN framework, respectively. In this chapter, various methodologies for syntheses of mesoporous materials are described, including recent advances in this field. It is certainly a kind of architectonics for mesoporous materials. This feature can be especially pronounced in hierarchic design of mesoporous materials. These related approaches can be categorized as mesoporous nanoarchitectonics. © The Royal Society of Chemistry 2012. Structural, optical and Raman scattering studies have been performed on the Dy substituted zinc oxide (ZnO) thin films (1, 3 & 5 wt%) fabricated through a sol gel based spray pyrolysis technique on preheated glass substrates. The hexagonal crystal structure with (002) preferred orientation was confirmed from the X-ray diffraction analysis for the undoped and Dy doped ZnO films. The crystallinity of the films decreased with increasing Dy content with a corresponding decease in the intensity of (002) orientations. Reduction in grain size with increase in Dy content was observed. The shift of E2 (high) mode observed in the Raman spectra towards the lower wave numbers with increase in Dy concentration was correlated with the increase in stress on the ZnO matrix upon Dy substitution. The optical band gap was found to increase from 3.17 eV to 3.27 eV with a transparency of 80% for higher Dy concentrations. A blue shift in the NBE emission was also observed for Dy doping. copyright © 2010 inderscience enterprises ltd.
Mesoporous TiO2 with nanocrystalline architecture has been synthesised by using microwave-assisted high temperature method using polymeric surfactant. The polymeric template was removed by stepwise carbonisation process. The structural order, band structure and the textural parameters of the calcined mesoporous titania were investigated by using numerous sophisticated techniques such as XRD, nitrogen adsorption, HRSEM, UV-Vis DRS and HRTEM. The obtained mesoporous TiO2 material have mesoscopic order, high surface area, crystalline walls and narrow pore size distribution as evident from the XRD and nitrogen adsorption results. Wide-angle X-ray diffraction pattern obtained for calcined mesoporous TiO2 shows that the pore wall of the sample is composed of highly crystalline Ti-O-Ti framework with an anatase phase. The photoluminescence properties of the mesoporous TiO2 was also analysed and the results were discussed in detail. Copyright © 2010 Inderscience Enterprises Ltd.
Mesoporous SnO 2 was prepared by a high temperature microwave assisted process using a low cost polymeric surfactant, poly(ethylene glycol). The obtained material has been characterized by several sophisticated techniques such as XRD, nitrogen adsorption, HRTEM, UV-Vis DRS, HRSEM and photoluminescence. The characterization results reveal that the obtained material exhibits a high surface area with a spherical morphology, crystalline walls and narrow mesopores. In addition, microwave process requires only a short time for the formation of mesoporous SnO 2. SnO 2 with no porous structure was obtained when hydrothermal technique was used. We also found that the band gap of the mesoporous SnO 2 is much smaller than that of the nonporous bulk SnO 2 and showed excellent photoluminescent properties. Copyright © 2010 American Scientific Publishers. SnO 2 nanocrystals in SiO 2:Eu matrix have been prepared at a relatively low temperature of 170°C for 4 h. Selective transition probability of Eu 3+ emission could be done after a suitable excitation wavelength. The room temperature exciton formation at 285 nm for as-prepared nanoparticles is observed and this gives the Bohr&apos;s radius of 1.4 nm. Exciton formation disappears for the nanoparticles heated at 500 and 900°C. This is related to the increase in particle size with heattreatment. A wide-band-gap (4.35 eV) quantum dots is obtained and will be important in photonics and UV-lasing application. Copyright © 2009 American Scientific Publishers All rights reserved. Ordered mesoporous materials with tunable pore size of 2-50 nm have attracted a great deal of attention due to their unique structures with organized porosity, high surface area, and pore volume, and impending applications mainly in the field of catalysis, adsorption, separation, sensors, and fuel cells. Three dimensional cage type mesoporous aluminosilicates (A1KTT-5) with different ns/nAl ratios were synthesized hydrothermally. The catalysts were unambiguously characterized and used for the acetylation of veratrole, and other aromatic substrates, e.g., anisole, isobutylbenzene, and 2-methoxynaphthalene, using acetic anhydride as an acylating agent under liquid phase conditions. The reaction conditions were optimized to get more conversion of acetic anhydride. The catalysts showed excellent performance in the acetylation of veratrole over zeolites and other mesoporous catalysts studied under the optimized reaction conditions. This is an abstract of a paper presented at the 18th Annual Saudi-Japan Symposium on Catalysts in Petroleum Refining and Petrochemicals (Dhahran, Saudi Arabia 11/16-17/2008). SnO2nanoparticles dispersed in Eu3+doped silica (SnO2-SiO2:Eu3+) were prepared at a low temperature (185 °C) in ethylene glycol medium. Transmission electron microscopy studies on as-prepared samples have established that SnO2nanoparticles having size of 4.6 nm are uniformly covered by the SiO2matrix. Significant extent of exciton mediated energy transfer between SnO2and Eu3+ions in heat treated SnO2-SiO2:Eu3+samples has been attributed to the diffusion of Eu3+ions from the SiO2matrix to the near vicinity of SnO2nanoparticles and its incorporation in the SnO2matrix. On the other hand, very weak energy transfer exists for SnO2: Eu3+nanoparticles heated at different temperatures due to the phase segregation of Eu3+ions from the matrix. Copyright © 2008 American Scientific Publishers All rights reserved. Three dimensional cage type mesoporous aluminosilicates (AlKIT-5) were successfully synthesized hydrothermally using pluronic F127 as a template under highly acidic medium. The reaction conditions were optimized to get more conversion of acetic anhydride, and the activity of these catalysts was compared with zeolite catalysts. The AlKIT-5 catalysts showed excellent performance in the acetylation of veratrole over zeolites and other mesoporous catalysts studied under the optimized reaction conditions. The kinetics of the AlKIT-5(10) catalyst in the acetylation of veratrole were elucidated. This is an abstract of a paper presented at the 18th Annual Saudi Arabia-Japan Joint Symposium on Catalysts in Petroleum Refining & Petrochemicals (Dhahran, Saudi Arabia 11/16-17/2008). Mesoporous carbon nitride materials have been synthesized using SBA-15 by pore filling technique whereas mesoporous boron nitride and boron carbon nitride have been prepared by elemental substitution technique using mesoporous carbon as template. The obtained materials have been unambiguously characterized by sophisticated techniques such as XRD, HRTEM, EELS, XPS, FT-IR and N2adsorption. The textural parameters of the materials are quite higher as compared to the respective nonporous nitrides. These materials could offer great potential for the applications, such as catalytic supports, gas storage, biomolecule adsorption and drug delivery. Novel carbon material, carbon nanocage, has been synthesized using cage-type mesoporous silica as a replica. The obtained carbon nanocage material has mesoporous structure with inner cages. The specific pore volume and the specific surface area of the carbon nanocage are much higher as compared to hexagonal type mesoporous carbon, CMK-3. The adsorption of lysozyme over these materials has also been studied. It has been found that carbon nanocage shows superior adsorption capacity as compared to other mesoporous carbon materials such as CMK-1, CMK-3 and CMK-3-150. Professor Ajayan Vinu has been appointed as an Adjunct Professor at the prestigious Institute of Chemical Technology in Mumbai, India. Globally-acclaimed material scientist and Australia’s leading nanotechnologist, Professor Ajayan Vinu will be recognised with the prestigious Council of the Chemical Research Society of India (CRSI) medal. Professor Ajayan Vinu of the University of Newcastle’s School of Engineering, has been elected Fellow of the World Academy of Art and Science (WAAS). University of Newcastle’s Professor Ajayan Vinu has been elected as an academician in the World Academy of Ceramics.